Mabel Greeley Merrill Beede was the first to conceive of the idea of “preserving some of the early local furnishings, equipment for home and farm, records, and so forth, which were of historical interest to the town, things we were troubled to see being neglected, destroyed, taken away from Sandwich." Acting on her suggestion, a meeting was called on August 24, 1917 by Carl G. Beede of those interested in the formation of a historical society. Col. Charles B. Hoyt was chosen chairman of the meeting and a committee was formed to nominate officers and prepare bylaws. At a meeting five days later, the Sandwich Historical Society was organized. Col. Hoyt was elected president, bylaws were adopted, and twenty charter members began their work. Mary Smith cottage is in the background, behind Marilyn Mudgett. Photo ca 1916. In 1920, the society rented the Mary Smith cottage at $25 per year. This little old building, one story with a basement (torn down in 1936), was directly across from the Town Hall. The house, though previously used as a shoe cutting shop and offices for a lawyer and the Selectmen of the town, was in poor condition. After diligent work the shop was ready to open in October 1920. The Society gathered items gradually and it was soon realized the two rooms in this building were not adequate for holding and displaying the collection. 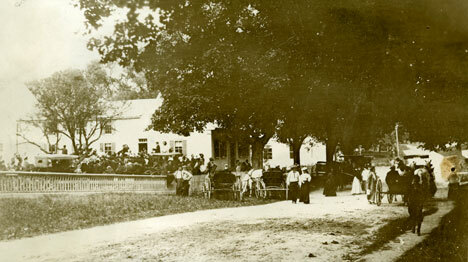 Also in that year, the Society held a picnic at the home of Moses Hall in Sandwich Notch. About 20 markers were placed along the way by Carl Beede marking the sites of homes or schools with details about those who lived there. Encouraged by the good attendance at the picnic, it was decided to make it an annual event. Mr. and Mrs. Alfred Moorhouse generously contributed a printed account of the first excursion and thus began an annual tradition of unique historical bulletins which have been indexed from 1920 to date. At the annual meeting in August 1927 it was announced that the Emma F. Gilman property, formerly the Elisha Marston place, could be purchased for $2,000 and that $1,200 had already been pledged. In order to legally hold property, the Society became a corporation on September 28, 1927. The arrangements made at purchase allowed Mrs. Gilman to live in three rooms and be the caretaker of the property. Soon after the mortgage was paid off in 1936, the house committee opened the attached barn for an exhibit of collections of tools, herbs, and weaving. In 1941, Herbert Warner constructed a replica of a small country store in the converted woodshed from items he had been collecting for years. In 1972, funded by a bequest from the estate of Joseph Wentworth, an addition was constructed onto the museum. It opened in 1973 with a large exhibit room downstairs and library and meeting room upstairs. References and notes from Excursion Bulletin No. 23 and Sandwich, New Hampshire 1963-1990.